The Mahican sachem Etow Oh Koam, or Nicholas, who went to London with 3 Mohawks in 1710. He holds a ball-headed club and the turtle at his feet indicates his clan. Painting by John Verelst, 1710. Detail of Nicholas' facial tattoos. In April 1710, four "Indian Kings" representing the Five Nations Confederacy of the Iroquois (Seneca, Cayuga, Oneida, Onondaga, and Mohawk) traveled across the Great Water to visit the court of Her Majesty Queen Anne in London. These Iroquois sachems, or civil chiefs, hoped to secure British military support against the marauding French and their Indian allies (Algonquin, Montagnais, and Huron) in Canada, and to ask for missionaries to come to New York State and instruct their people. Although Native Americans had visited England before (e.g., Pocahontas in 1616), none had ever been treated as royalty on a state visit! The "Four Indian Kings," as they were known in England, caused a real sensation in old London town. They were celebrated and honored everywhere they went, and as foreign dignitaries of state the Indian Kings were given a Grand Tour of London, including a performance of Shakespeare's MacBeth and a visit to the Royal Opera. They also attended a "trial of skill with sword" between two fighting Englishmen and visited the Cockpit Royal, where they witnessed the "Royal Sport" of cockfighting firsthand. A large collection of historical documentation survives that recounts their memorable visit including numerous versions of their speech to Queen Anne, other published accounts of their visitation, some 30 portraits of the Kings in the form of engravings and miniatures, and four portrait oil paintings. For us, and from the standpoint of tattoo artistry, these oils are important because they accurately depict - perhaps for the first time in Western history - the facial and body tattoo of the Iroquois and neighboring Mahican. Of the four Indian Kings, only three were actually tattooed. Two tattooed sachems were Mohawk (Ho Nee Yeath Taw No Row and Sa Ga Yeath Qua Pieth Tow) and one (Etow Oh Koam or John) was Mahican, a tribe that was loosely allied to the Five Nations Confederacy. In each portrait, the clan totem of each King (wolf, bear, turtle) is represented standing near the base of the canvas. Moreover, all three Kings are presented with their weapons; these symbols attest to their success and prowess on the field of battle. 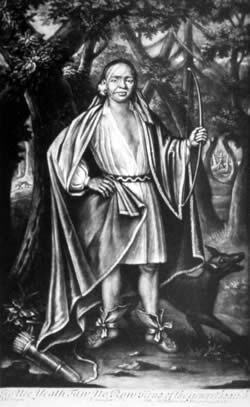 The portrait of Etow Oh Koam is significant because it is the only known portrait of an 18th century Mahican chief. 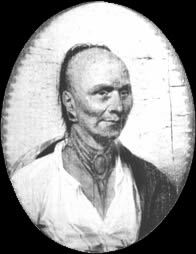 Sa Ga Yeath Qua Pieth Tow, also known as Brant, was the grandfather of Joseph Brant, the prominent Mohawk war chief who later settled the Six Nations Reserve near Brantford, Ontario. Today this reserve is the most populous in Canada and the largest Iroquois reservation in Canada and the United States. 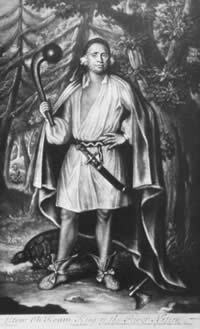 Sa Ga Yeath Qua Pieth Tow, or Brant, a Mohawk war chief with musket in hand. His belt is decorated with black, red, and white dyed moosehair or porcupine quills. His moccasins are decorated with red and tan quills and tied with red ribbons. He has downy white feathers by each ear, red ribbons hanging from his right ear, and has a powderhorn on a red cord. Behind him is a bear representing his clan. Painting by John Verelst, 1710. Full color close-up of Brant. Reconstruction of Brant's facial tattoos. 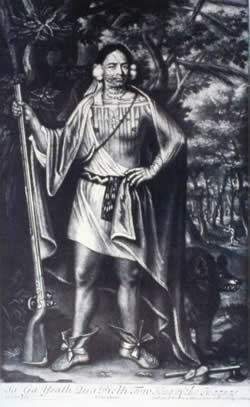 Ho Nee Yeath Taw No Row, or John of Canajoharie, a Mohawk sachem with bow in hand. Behind him is a wolf, representing his clan. Painting by John Verelst, 1710. 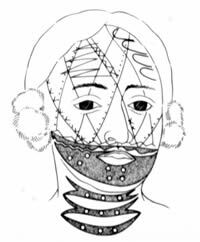 Reconstruction of John's facial tattoos. Good Peter, Oneida, aged 75, showing fine tattooed pattern in gray on neck and chest. His earlobe is pierced and stretched to hold an ornament. His head is shaved except for a scalplock. Miniature oil painting by John Trumbull, 1792. 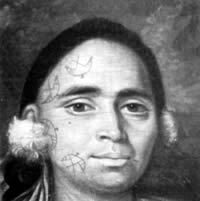 Iroquois women, however, were rarely tattooed. But when they did, the purpose was usually medicinal, as a remedy to cure toothache or rheumatism. 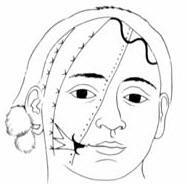 According to the Jesuit priest Lafitau, these women "content themselves with having a little branch of foliage traced along the jaw. They claim that the nerve by which the humour flows over the teeth is thus pricked, so that it can no longer fall there and that thus they cure the pain by going to the source of the ill."
Iroquois men tattooed to signify achievement on the field of battle, including cross-hatches on the face to record successful military expeditions, or other small marks on the thighs to indicate the number of enemies killed. According to a Jesuit relation of 1663, one Iroquois war-chief bore 60 tattoo marks on one thigh alone! Many other markings, which have lost their meaning and function, were placed upon the face and body, although some were probably totemic. 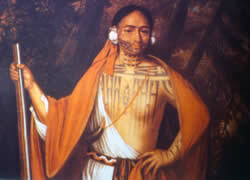 Nevertheless, nearly all Iroquois men's tattoos were distinct to them. 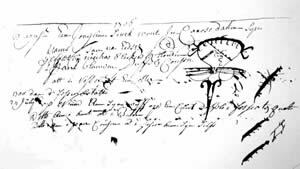 According to the account book of Dutch trader Evert Wendell dated August 13, 1706, "a young Seneca, living in Canosedaken, his name Tan Na Eedsies," visited Wendell in Albany, New York and completed his transaction by drawing a pictograph next to his order. This drawing identified Tan Na Eedsies, and the tattooed patterns on his face, neck, and chest were considered equivalent to his personal signature. An entry from the 1695-1726 account book of Evert Wendell, the Dutch trader to the Indians living in Albany, New York. This entry, written in Dutch, is dated August 13, 1706 and shows the portrait of the Seneca Indian Tan Na Eedsies. This drawing worked as his personal signature, identifying him by the tattooed patterns on his face, neck, and chest. America's Tattooed Indian Kings returned to Boston on July 15, 1710. Although the sachems had witnessed "the Grandeur, Pleasure and Plenty" of the British nation, Brant soon died after his return from London. And as history would have it, both Nicholas and John faded into obscurity. Nothing more is known of them. In the summer of 1711, however, a massive British military expedition involving some 12,000 American colonists and 800-odd Native Americans from the Five Nations did set sail from Boston in 60 transports and 9 man-of-war. Their destination was the French stronghold of Quebec; the palisaded city that was the key station to the important trade routes on the St. Lawrence River and Great Lakes. Unfortunately, in the darkness and swift currents of the St. Lawrence, several of the British ships ran aground on the Île-aux-Oeufs and the expedition was abandoned. Although the memory of their visit was to be documented well into the 19th century, the Kings' trip to London had little significance in the broader scope of American history. French power persisted in Canada until the fall of Montreal in 1760. And with the Treaty of Paris in 1763, the St. Lawrence River and Great Lakes region were opened to English settlement. Ironically, the westward movement of colonists towards Iroquois lands led to the eventual collapse of the Five Nations. And after 1763, a series of military, political, and economic disasters compounded these and other problems. During the American Revolution, the Iroquois Confederacy at first attempted to remain neutral. But as time wore on, it was evident that a course of action had to be taken and the member tribes had to pick allies. Many of the Mohawks chose to side with the British, as did the Onondagas, Cayugas and Senecas. But the Oneidas were sympathetic to the Americans. Being unable to reach a consensus, the Iroquois League disbanded in 1777 and each Nation was left to pursue its own fate. Of course, the Americans won their independence from Britain and from 1783 to 1797 most Iroquois tribes were deprived of their land and of their diplomatic and military power under the effective sovereignty of the United States. Soon thereafter the Iroquois were confined to a few small reservations in the United States and Canada, many of which exist today. 1952 Queen Anne's American Kings. Oxford: Clarendon Press. 1977 Customs of the American Indians Compared with the Customs of Primitive Times, 1724 (2 vols.). Toronto: The Champlain Society. 1896-1901 The Jesuit Relations and Allied Documents, 1610-1791 (73 vols.). Cleveland: Burrows Brothers.